King County has cited eight winery tasting rooms for operating on rural- or agricultural-zoned land just outside Woodinville. Owners say they’re part of a booming wine and tourism industry. Sal Leone, the grandson of Italian immigrants, speaks expansively about the pleasures of being a winemaker. He’s opened two tasting rooms and a brew pub just north of Woodinville, not far from a dozen other tasting rooms and Chateau Ste. Michelle. Visitors can sip wine or beer outside on his slate patio with piped-in music, a bubbling water feature and a lush semicircle of landscaping that screens them from the arterial in front and the parking lot behind. 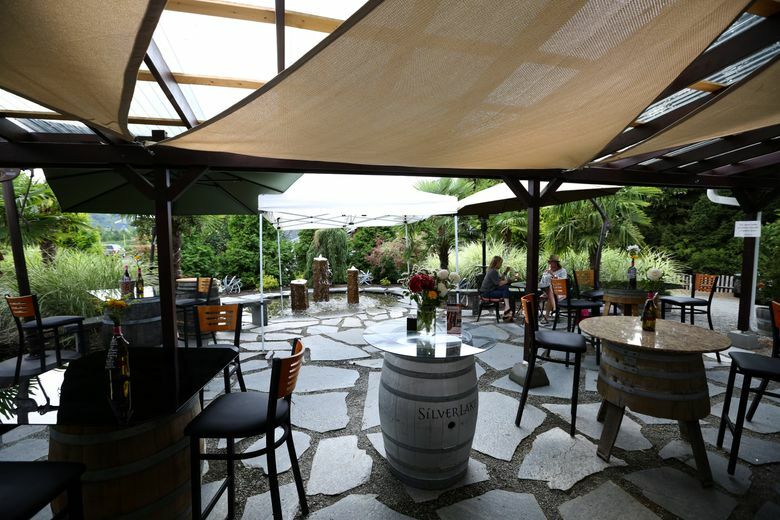 “We sell romance in the wine business,” said Leone, a retired periodontist whose SilverLake Winery was one of the first to open in Woodinville, in 1992, in the heart of what’s now a booming wine industry that attracts about 750,000 tourists a year. But King County says the passion is being sold in the wrong spot, and that retail is trampling on land meant for agricultural uses. Leone’s business and seven other tasting rooms were slapped with violation notices by King County between March and July for operating businesses, sometimes for years, on land zoned rural or agricultural. The crackdown has divided residents of the area. Advocates of preserving the Sammamish Valley for farms and other agricultural uses say the encroachment by businesses threatens some of the region’s most productive lands by driving up property values and making it unaffordable to farmers. Leone, for instance, paid almost $1 million for 1.5 acres in 2014, while just months earlier the property was assessed at $416,000 when it was still a single-family home with a repair shop for tractors and farm equipment. Leone and the other owners and operators of the tasting rooms are unapologetic, saying wineries are an agricultural use, even if the grapes are grown hundreds of miles away. They say the small houses they’ve remodeled into tasting rooms fit well with the surrounding wineries and farmland. And they’re mostly located along the main thoroughfare between downtown Woodinville and the Hollywood wine district, where tasting rooms are allowed. They say their properties are a reasonable extension of the popular wine-tourism trade, employing dozens of people and generating tax revenue for the county. Last month they organized into a group called SHOW — Stop Harassing Our Wineries — to press the county to find a way for them to stay in business. The other wineries cited for illegal tasting rooms are: Castillo de Feliciana, Patit Creek and Forgeron Cellars, Cave B, Winery Kitchen, Matthews and Cherry Valley. Each was given 45 days to shut down, relocate or apply for county permits, which could include an application to be considered a home occupation. If corrective action isn’t taken, the county can start legal proceedings to close the tasting rooms, said Jim Chan, assistant director of permitting for the county Department of Permitting and Environmental Review. The fight over protecting agricultural and rural land also has become an issue in the Metropolitan King County Council race in which incumbent Jane Hague is being challenged by Bellevue Mayor Claudia Balducci. Hague scheduled a campaign fundraiser this summer at Leone’s tasting room but canceled after she was contacted by some Sammamish Valley farm advocates. Balducci cited votes by Hague and other council members who caucus as Republicans to use rural lands for other purposes, including twice trying unsuccessfully to add nearly 50 acres of rural Duthie Hill to the urban-growth area adjacent to Sammamish and zone it for residential development. “Councilmember Hague has been on the wrong side of the issue time and time again,” Balducci said. 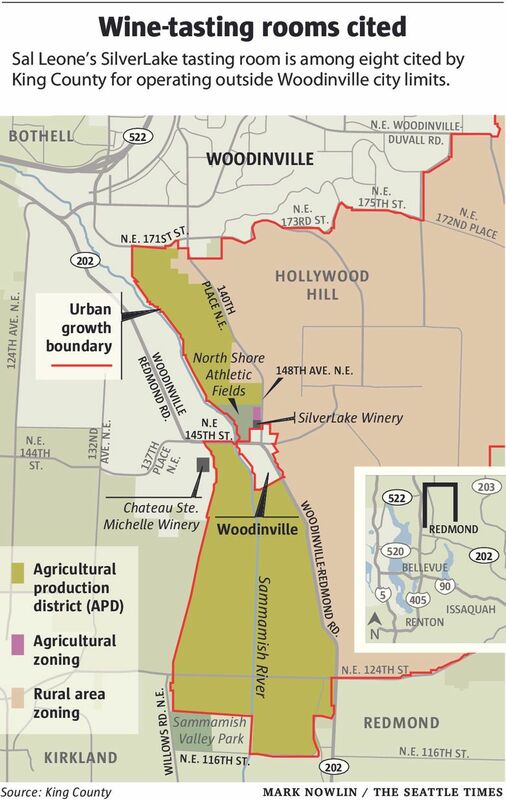 Hague countered that the council majority (members of the nonpartisan council who caucus as Democrats) promised to initiate a joint planning effort with the city of Woodinville in 2012, the last time the controversy arose between the wine industry and agricultural users. That pledge to work together followed the County Council leadership’s rejection of a Woodinville request to redraw the urban-growth boundary to allow more development at its borders. The rural boundary wasn’t breached, but Hague said there was no follow-through on addressing the problems. “We have a precious resource in our agricultural land that needs to be balanced with a growing wine economy and tourism industry,” Hague said. Advocates of preserving the farmland say it was protected decades ago precisely to create a bright line against urban sprawl. Tom Quigley, president of the Sammamish Valley Alliance and manager of a 65-acre farm north of Leone’s land, said that over the years, he and other residents have fought off proposals for sports fields, a hotel and other retail uses on what’s now agricultural land. Standing on his farm, where he also runs a small tree nursery, Quigley points out plots being worked by 11 other tenants, including three Hmong farmers and students at four community colleges. “Agriculture is alive and well and it’s only going to get better as the demand for local produce continues to grow,” he said. About the only thing the two sides agree on is that the county has been lax in enforcing the land-use codes. 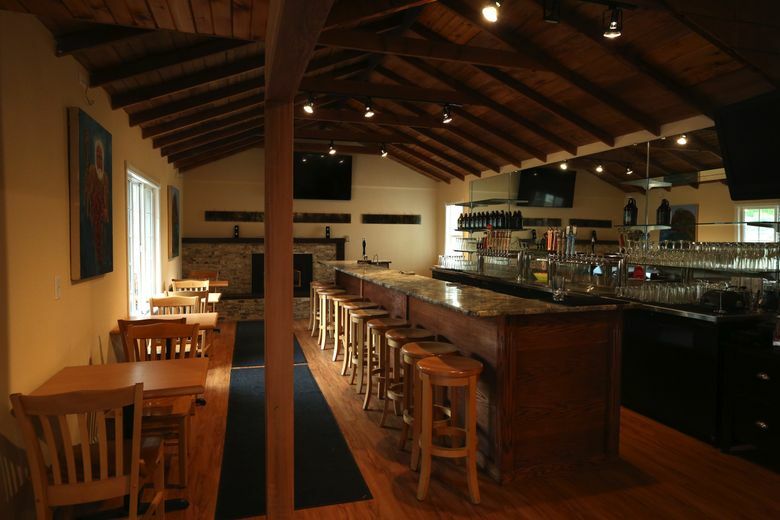 Cougar Crest’s tasting room, for example, had been operating just south of the Woodinville city limits for two years before being cited in June. And for four years before that, Hollywood Hill Vineyards ran its tasting room out of the same remodeled house, said property owner Steve Lee. “I don’t know why anyone would complain. 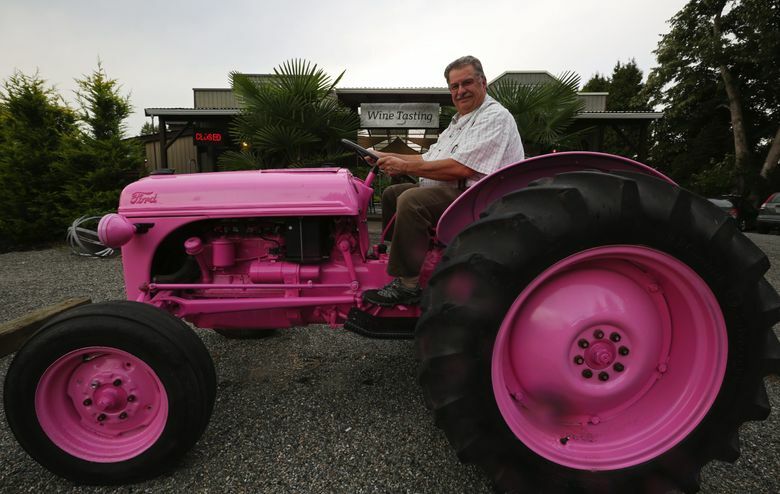 Woodinville revolves around wineries and tasting rooms,” he said. Lee said he feels particularly aggrieved because Woodinville built sidewalks on two sides of his property when it added a roundabout to handle the increasingly heavy traffic along the Woodinville-Redmond Road. Now the county is telling him his tenants can’t operate there because the property is zoned rural. John Starbard, King County’s director of Permitting and Environmental Review, said the county has a long history of protecting agricultural lands for agricultural uses. The pressures from the wine industry, which stands to make a lot of money converting the land to retail and commercial uses, shouldn’t change the county’s enforcement of its rules. He said enforcement officers respond primarily to complaints and wouldn’t necessarily know — even for several years — if a tasting room was operating in violation of the codes. The county just added a planner to focus on unincorporated areas around cities, Starbard said. With more staff, the county can take on the joint planning effort with Woodinville promised in 2012. That initiative will include ongoing conversations with the wine industry and agricultural advocates, he said. Even within the wine business, many oppose the wildcat tasting rooms. The vast majority of wineries and tasting rooms in the area have spent the time and money to go through the permitting process to make sure they’ve complied with all the regulations, said John Patterson, owner of Patterson Cellars and the vice chair of Woodinville Wine Country, a marketing and promotional group for the 108 wineries and tasting rooms around the valley. “I don’t think anybody should be grandfathered in because they opened illegally,” he said. Leone has appealed his violation notice from the county and asked for an extension until November to present his case. He’s suggested grazing alpacas or planting rows of grapes behind the brew pub to meet the county requirement that the primary use on agricultural land be agricultural. And if the county turns him down, Leone said, he’s going to find the stinkiest pigs and the noisiest roosters, knowing that next door, in the city of Woodinville, the neighboring business owner, who is planning to add a 12-room hotel, is sure to complain.